With the current worldwide trends towards the increasing affordability of mobile devices, rapid development of internet connectivities, and ease of use of web and mobile applications (apps), information and communication technologies (ICTs) are increasingly being used to develop sophisticated systems to address some of the world’s more pressing social and ecological challenges. Examples abound globally of development projects that are making use of cellular technology to empower local communities to monitor issues as diverse as natural resource use, climate change and disaster risks, community health and water quality, and to empower these same communities with marketing and management tools. Implementation of the United Nations Food & Agricultural Organization’s (UN-FAO) Voluntary Guidelines for Securing Sustainable Small-Scale Fisheries (VGSSF) – with a focus on fisher empowerment and transformation of unequal power dynamics – provides a critical opportunity to ensure that marginalised small-scale fisher (SSF) communities are able to gain access to, and harness the power of, affordable and easy-to-use ICTs. The Guidelines specifically cite the need for ‘digital inclusion and other skills of a technical nature that generate added value’, encouraging States to ensure that fishers have access to these services (Section 6), and promoting the development of technologies that are able to support women’s work (Section 8.4) and that are ‘culturally appropriate’ (Section 9.9). 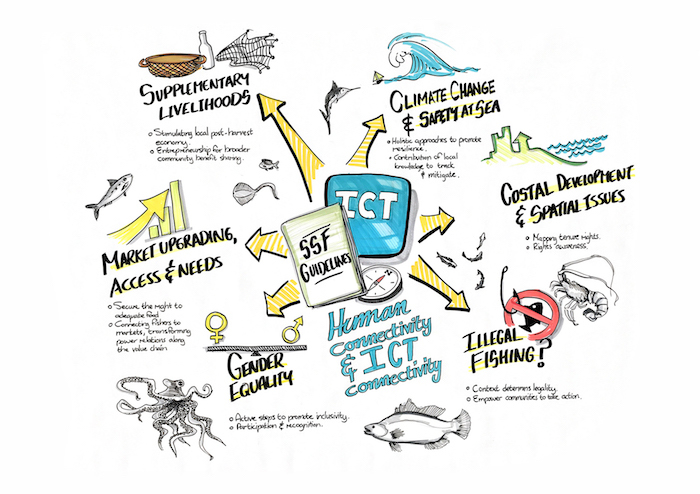 Multiple entry points for the use of ICTs are evident in the call for the empowerment of SSF and their access to a range of resources, infrastructures, market opportunities and equitable participation in research, monitoring and governance of fisheries. 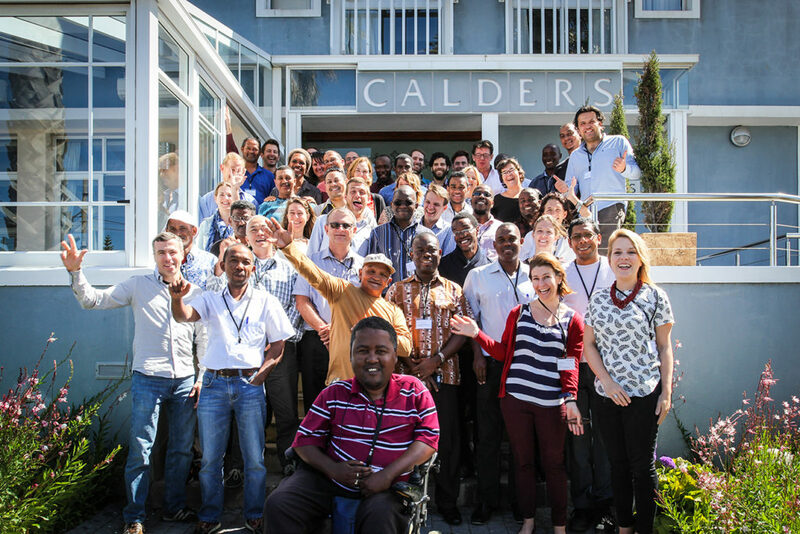 Towards this end, Dr Serge Raemaekers, International Collective in Support of Fishworkers (ICSF) member and founder of the Abalobi initiative in South Africa, co-ordinated the hosting of an international workshop on ICT for Fisheries (ICT4Fisheries) in November 2016 in Cape Town, South Africa. Entitled ‘ICTs for equitable and sustainable small-scale fisheries: promoting international cross-learning’, the workshop was co-hosted by Abalobi, the University of Cape Town’s Centre for ICT4D and Blue Ventures, and made possible with funding from the Western Indian Ocean Marine Science Association (WIOMSA). Abalobi Fisher – The foundation of the app suite where fishers’ co-produce knowledge by collating their own catch data in a personal logbook with sharing options. The app includes planned safety-at-sea integrations and the opportunity to capture a range of climate-related data. Fishers download this for free, and are supported daily by Abalobi‘s field team, local fisher assistants and the Fisheries Authority’s fishery development workers. Fishers use the dashboard summaries in daily fishing operations and towards co-management of their community fisheries. Abalobi Monitor – Digitised community catch monitoring at the landing site and along the shoreline, with the ability to feed into a centralised information-management system for enhanced evidence-based decision-making and policy development. The Fisheries Authority is rolling this app out along South Africa’s coastline. The system detects fishers who openly use the Abalobi Fisher logbook, thereby allowing data validation and the use of real-time data for decision-making. Abalobi Manager – Real-time fishery data, access to relevant oceanographic data and information and communications for co-management. This is the interface for Government fisheries managers and co-management committee members. Abalobi Co-op – Co-operative member and fleet management. This includes a tool for collective accounting, enabling all members of the co-operative to be accountable and transparent, thereby promoting equitable practice, and facilitating catch value-adding and the creation of opportunities for women and youth who may not be involved directly in harvesting activities. Abalobi Co-op is intended to equip fisher co-operatives with the tools that can drive the development of community-based, sustainable small business entities. The technology also allows co-operatives to connect with FinTech (online banking, micro-credit) and InsureTech (tailored life and fleet insurance). Abalobi Marketplace – Fish with an ecological and social ‘story’. A virtual market where fisher co-operatives can share their story and post their daily catches for sale to consumers, restaurants and larger retailers. This component stimulates the idea of community-supported fisheries (CSF), empowers fishers in the value chain, and at the same time allows for the development of fisher-community-based labelling and marketing mechanisms. Abalobi Marketplace is currently in proof-of-concept phase with further co-design and development planned for 2017. Networking with other partners around the world who are at various stages of working with ICTs in SSF – EcoTrust Canada who have developed ThisFish; the Caribbean ICT Research Programme (CIRP) who have developed mFisheries; key persons working with Open Data Kit (ODK) in organisations such as Blue Ventures based in Madagascar, the World Bank and UN-FAO; as well as organisations such as the Technical Centre for Agricultural and Rural Co-operation ACP EU (CTA) – gave birth to the dream of hosting an international workshop that would enable the sharing of experiences and lessons in developing and using ICTs specifically for SSF. This workshop was the first ever international workshop of this nature. The workshop was planned and co-facilitated by Serge Raemaekers and Jackie Sunde from the University of Cape Town, together with Steve Rocliffe and Tori Jeffers from Blue Ventures. Over 50 participants attended the workshop, including representatives of fisher organisations, the UN-FAO, State parties, NGOs and CBOs, as well as research institutions and organisations providing technological support. Participants represented regions from across the globe: Tanzania; Seychelles; Mauritius; Mozambique; Madagascar; South Africa; Uganda; Trinidad representing the Caribbean countries; Canada; the USA; UK; the Netherlands, France; Belgium and Italy. Key participating organisations with extensive presence in a number of countries included: the World Forum of Fisher People (WFFP); WIOMSA, working throughout the Indian Ocean region; as well as organisations such as the CTA which works in more than 79 countries. From the outset it was apparent that various open-source platforms, already in existence or in development, can enable fisher communities to be incorporated into information and resource networks: from fishery monitoring and maritime safety, to local development and market opportunities. Critical questions in this approach pertain to data ownership, protection of local knowledge and power imbalances related to the use of new technologies and data. Further questions lie in the scale and uptake of such technologies in regional fisheries management efforts. The workshop enabled a process of interrogating some of these key challenges and deepening the understanding of factors and processes that can enable ICTs to contribute towards the implementation of the human-rights-based approach that underpins the VGSSF. The workshop included a presentation on the VGSSF and, linked to this, a presentation by Florence Poulain of the UN-FAO on how ICTs can contribute towards achieving the principles of the Guidelines with specific attention to the thematic area of Disaster Risk and Climate Change. These presentations highlighted the fact that ICTs are central to all 13 themes of the VGSSF. This was followed by a ‘tech sharing’ session using Knowledge Café Methodology. In small groups, select ICT tools were demonstrated and participants were given the opportunity to test the tools and explore how each attempts to address key challenges faced by SSF and associated stakeholders. The tools included: ThisFish (demonstrated by Eric Tamm from EcoTrust Canada); VMSTrack (Petrus van der Linde of Coastal Livelihoods Foundation); Open Data Kit (ODK) (Thierry Nohasirivielo, Steve Rocliffe and Tori Jeffers of Blue ventures, and Gertjan de Graaf of the UN-FAO/World Bank Artisanal Fisheries Data Programme); mFisheries (Kevon Andrews of CIRP); and Abalobi (Serge Raemaekers, Abongile Ngqongwa, Andrew Cawood and Nico Waldeck). Groups explored the way in which each tool contributes towards the empowerment of fishers and which of the main VGSSF principles or thematic issues are addressed. The report back to plenary highlighted a very rich harvest of lessons and emerging issues. It was apparent that each of these tools is contributing to a wide range of issues from fisher empowerment in data capture and management processes, to how traceability can empower SSF and help them build leverage in the value chain. The use of ODK in African artisanal fisheries has provided an efficient, time- and cost-saving mechanism for capturing data in the vast and very widely spread contest of many African SSF communities. Key questions remaining include issues such as how to validate data quality and how to empower fishers to be able to use the data to engage in Climate Change research from a position of strength and hold governments to account. 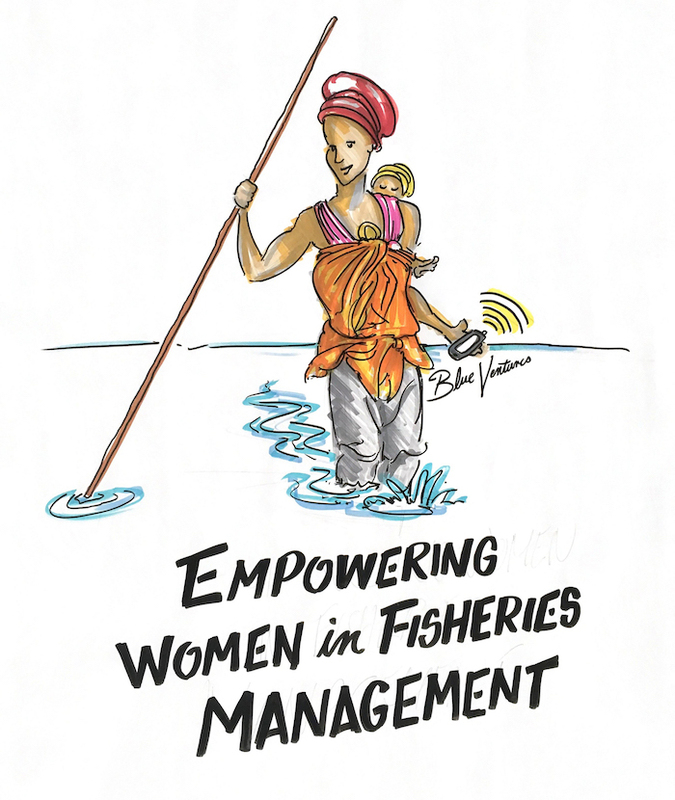 The ODK used by Blue Ventures has enabled women fishers to be empowered and to take their skills back to their households and share them with their male partners and youth. Participants were struck by the way that Abalobi has empowered fishers through the co-production of the platform from the onset. The mFisheries app demonstrated that use of simple technology can be extended to capture fishers’ stories as well as provide an accessible platform for multimedia training and capacity-building on issues such as safety at sea. It also provides access to real-time information from the cloud on a range of oceanographic data for fishers. A key insight emerging from VMSTrack has been the manner in which an ICT tool can serve as an entry point into community-focused issues such as promoting safety at sea, but then also serve as a catalyst for further social development. In particular, VMSTrack has contributed towards building community cohesion and solidarity, which in turn provides a springboard for alternative livelihoods and community-development projects. The particularly innovative and powerful process of ‘graphic harvesting’ (see graphics below) was used for capturing the issues emerging from the discussions and outcomes of the workshop – illustrations by Grant Johnson (www.graphicharvest.co.za). Abongile Ngqongwa emphasised that the approach to assisting communities to access technology is very important. 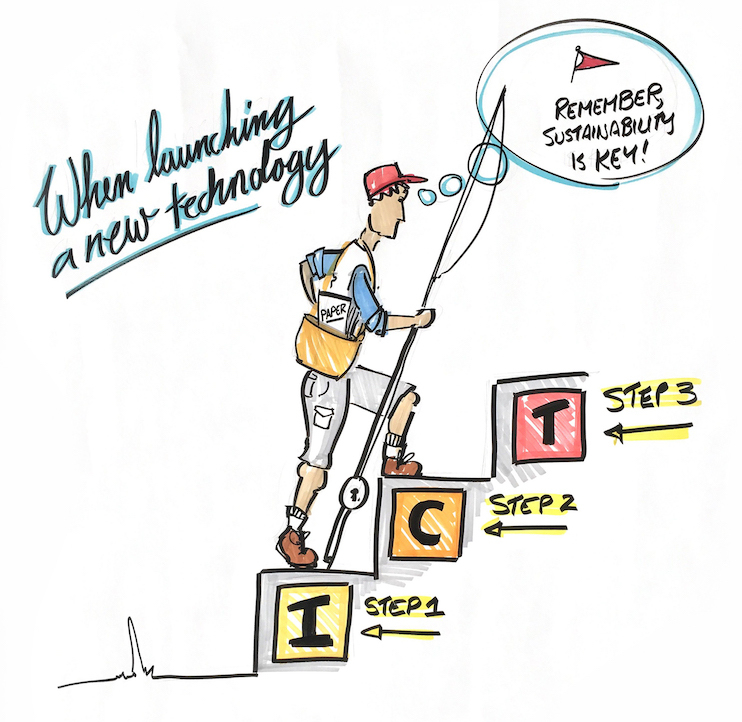 Once you have introduced the idea of using the technology, then make sure that you develop the technology with the communities – once the tech is developed collaboratively, it takes away the burden of training, as fishers own the system that they are developing, so the skills are developed along the way. This theme of empowerment and the need to ensure that fishers retain control over their own data was a consistent thread running throughout the discussions. The local South African fishers who have pioneered the development of Abalobi shared their journey with other fisher representatives from Mozambique, Mauritius and the Seychelles and a rich exchange of ideas and experiences led to a commitment to continue this exchange and attempt to extend the reach of Abalobi across the Indian Ocean. In return, the Abalobi fishers appreciated the ideas on how to promote gender equality that the Blue Ventures experience with their ODK tool highlighted. These male fishers expressed their eagerness to return home and ensure that they extended their work to include women and all activities along the value chain when developing their Abalobi platform further. 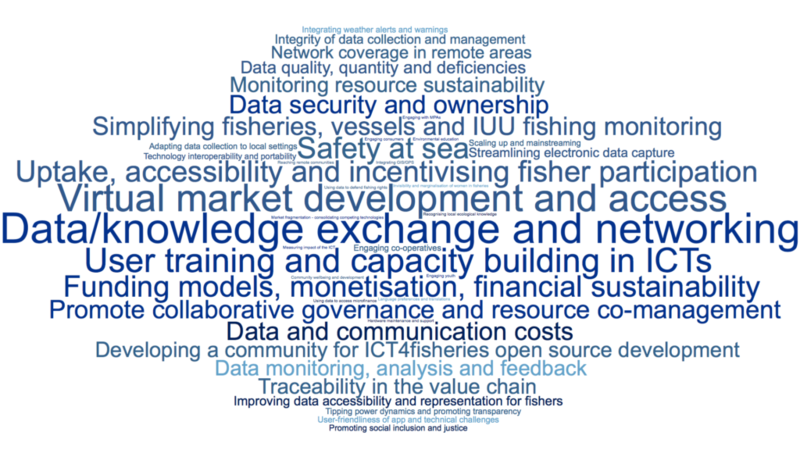 A key outcome of the workshop has been the establishment of a website and platform for networking on ICT4Fisheries (www.ict4fisheries.org.). The objective is to create an easily accessible portal where fisher groups, organisations and other stakeholders can gain a glimpse of the types of ICT4Fisheries projects that are in existence and share lessons learnt. It aims to promote the use of the VGSSF and ICT development as a key tool for implementation of the Guidelines in the coming years. Already there are resources emerging as Blue Ventures has written a handy manual on ODK to share and EcoTrust Canada has explored the issue of traceability in the value chain. The intention is that the portal will create a starting point where the group and others can connect with each other, network and extend the ripples outwards as ICTs become a key means of communicating, monitoring and documenting the implementation of the VGSSF. The minutes, graphics and reports from this workshop and further information about the ICT tools that were demonstrated at the workshop are all available on the website. See www.ict4fisheries.org.